Three strategies for introducing students to a new game in a playful, immersive way. Imagine that you are spending 20 minutes seated around a game board, watching someone hold up every game piece, list the rules, and describe every part of the game. Does this game sound fun? Do you want to play it? First impressions count! Whether you're playing a game with your students for the first time or the 100th time, how you "roll out" or introduce the game matters. Nobody likes a "gamesplainer" standing between them and a good time. Your job as a teacher in rolling out a game is to let games do what they do well -- create playful, immersive experiences where players learn by doing. That sounds simple, but we've found that a seemingly effortless game rollout takes a bit of planning. Learning by doing isn't just for players. You'll want to play the game a few times, with both adults and kids, until you know it well. Playtesting with a small group is great way to figure out how clear your rules and instructions are. Ask yourself: "What is the minimum amount of instruction I have to give before they can get started?" Now you are ready to think about how you'll introduce it to your class. We've seen dozens of ways that teachers have rolled out games. Which method will work the best for your game? Here are a few examples that can help you. Rebecca is rolling out a discussion-based game called Socratic Smackdown in her eighth grade English class. The game's goal is to support students in developing discussion and argumentation skills. It's styled similar to a Socratic Seminar, and students engage in discussion both collaboratively and competitively. Since the game can be used with any text or topic, Rebecca’s students will play it several times this year. Rebecca uses the fishbowl method to roll out this game, because it allows the class to watch and play along together, letting everyone learn the rules while one group is engaged in play. In a fishbowl, a small group of students (4-6, in this case) sits in the middle of the room while everyone else sits around them in a circle on the outside. The students inside the circle are given a topic and a set of questions to discuss. Students on the outside have scorecards identifying the skills their classmates should be exhibiting (such as using evidence to back an idea and not interrupting), and they award points for behaviors they see in action. Rebecca switches students in and out of the fishbowl every five minutes, and stops to ask the kids on the outside for their comments and questions. If unexpected things happen in the fishbowl -- for example, if a student discovers contradictions in rules, gets confused, or asks questions that Rebecca didn't anticipate -- she doesn't view them as obstacles. Instead, she asks students to work with her in figuring out what to do. Games are highly modifiable systems. Students who want to improve them or make them more fun could be fantastic innovators! That's why Rebecca gives students a space to figure out the rules together and modify them in ways that might work better for the group. After 30-40 minutes, when all the kids have experienced the game in some way, they not only understand how the game is played, but have also developed strategies together to achieve the learning goal. Limor uses an interactive digital history game called Mission US in her seventh grade social studies class. In this game, students are put in the shoes of a printer's apprentice in 1770 Boston and encounter both Patriots and Loyalists around the time of the Boston Massacre. The goal is for students to choose where their loyalties lie. Along the way, they engage in empathy and explore issues of liberty, equality, and perspective. Limor's students play "Mission 1: For Crown or Colony?" together. To roll out the game, she projects on the smartboard and asks one student to come up and start playing. As that student navigates the game, she asks the rest of the class to help him or her identify the rules. She rotates which student is playing several times, stopping for class discussion about what choices the player should make and why. This method makes the most sense for Limor because she can engage students of all ability levels in playing together, and the class can work collaboratively to understand gameplay and winning strategies. Fifteen minutes later, when playing individually on computers, students are able to make informed choices about how they want to play and get started with minimal assistance. Before this, Limor reviews the rules she has already created with her class around being respectful and using technology appropriately. 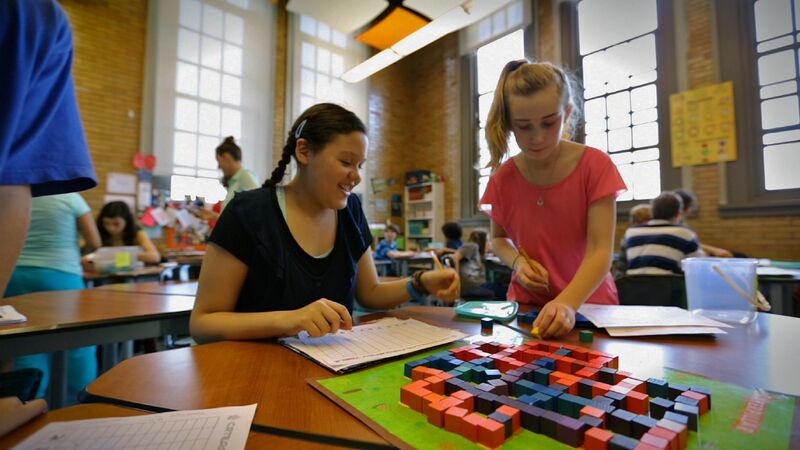 As students play, she circulates the room and closely watches their engagement level – after all, she picked the game because she thought it would be fun, in addition to helping students learn. If they seem bored, she asks why they aren't interested in the game. In this way, she uses the game to gather information about student learning styles, preferences, and ability levels. Arthur uses the simplified game strategy with a card game called Zero Out in his seventh grade math class. This works really well for him because Zero Out is a complicated game. If he starts with the full version, there are too many rules to confuse players. The simplified strategy allows for students to explore the rules with freedom and imagination, and helps them understand why these complex rules and structures are so important. The learning goal of Zero Out is for students to practice breaking large numbers down into pieces and to zero out pairs by combining numbers with their additive inverse. In the game, students have to combine negative and positive number cards to see if they can make "zero." In the full version of the game, students play in groups of four, combining and adding cards to make zero (-7 + 3 + 4 = 0). They can steal from and trade with other players, discard and pull from a central pile, and add up the cards' coin symbols to gain points. But for the first and simplest version, Arthur just asks the kids to work in teams of two to combine up to three cards, zero them out when possible, and discard. In this version, it takes only a few minutes for him to explain the rules and get the students playing. Pretty soon, the students say that they want to start combining more numbers or stealing each other's cards. They might say, "I wish I could trade!" At that point, Arthur engages the class in a discussion about how trading would make the game more fun and interesting, and then introduces that option. This is how the class builds up to a full version of the game. He can also see which students are struggling with the most basic version and create differentiated groups when needed, allowing him to give out more complex cards to students who are ready. Game-based learning is more than just picking the right game for your classroom. It’s about designing a meaningful learning experience for your students. For more about this approach, check out Managing In-Class Gameplay and Using Games for Assessment. How do you roll out games in the classroom? Watch the video above for our tips, then share your own tips and methods for rolling out a game in the comments!